By some estimates there could be more than 100 billion potentially habitable planets in our galaxy alone. While “potentially habitable” does not mean a planet is inhabited, if life arose on even a fraction of those worlds there should be millions if not billions of inhabited planets in the Milky Way. So why haven’t we seen evidence of them? Not counting the (slim) chance of an alien megastructure around KIC 8462852, the galaxy seems remarkably quiet. Projects such as SETI have scanned the heavens for radio signals, and found none thus far. 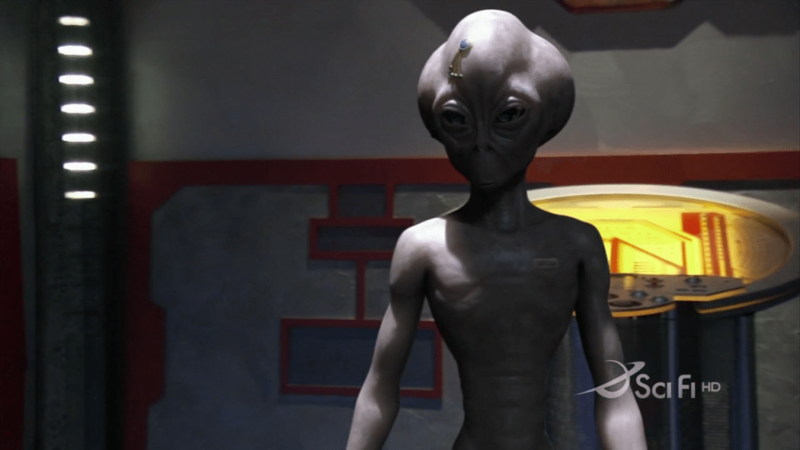 Infrared sky surveys haven’t found thermal signatures of any alien civilization. This apparent silence given that extraterrestrial life should be common is often referred to as Fermi’s paradox. Lots of solutions have been proposed to address the paradox: perhaps they are intentionally being quiet; perhaps we just happen to live in a particularly barren corner of the galaxy; perhaps they lost interest space exploration and instead watch reality television. An alternative explanation is that life may be far more rare than we think. Perhaps the odds of life arising on a planet are so unusual that out of 100 billion possible worlds, only one has given rise to life. The problem with this idea is that we know life arose quite early on Earth. On a geologic scale, as soon as Earth cooled enough to be potentially habitable we starting seeing life. We also know that the building blocks of life such as amino acids are found in comets and asteroids. That would seem to imply that life forms readily on habitable worlds. On Earth life eventually gave rise to a technological civilization, so why wouldn’t that happen on some other worlds as well? Life may play a necessary role in keeping a planet habitable. Credit: Chopra and Lineweaver. A new paper in Astrobiology proposes a solution. Perhaps life does arise on most potentially habitable worlds, but doesn’t get a strong enough foothold to keep the planet habitable for billions of years. Their idea is known as the Gaian bottleneck. Life may form readily on a habitable world, but life as we know it requires an atmosphere containing volatiles such as water, ammonia and methane. These are common molecules, but their abundances can be thrown out of whack by geologic processes. For example, Mars and Venus were both warm and wet in their early history, with plenty of the ingredients necessary for life. But rising carbon dioxide levels pushed Venus toward a runaway greenhouse effect, while Mars lost its atmospheric water and became cold and dry. Of the three potentially habitable worlds in our solar system, only Earth gave life a strong foothold, eventually leading to a rise of atmospheric oxygen and other volatiles through biological processes. The authors argue that life plays a central role in maintaining a habitable world. Living organisms keep the molecules necessary for life in the system as it were, so the more life you have on a planet the more habitable the planet is. As a result, there could be a certain critical mass necessary for life to survive long term. Planets that break through the Gaian bottleneck can sustain life for billions of years, but if it’s rare for life to break through the bottleneck, the Universe may be filled with living planets that soon become inhospitable. The Universe may be silent because planetary extinction is the rule rather than the exception. 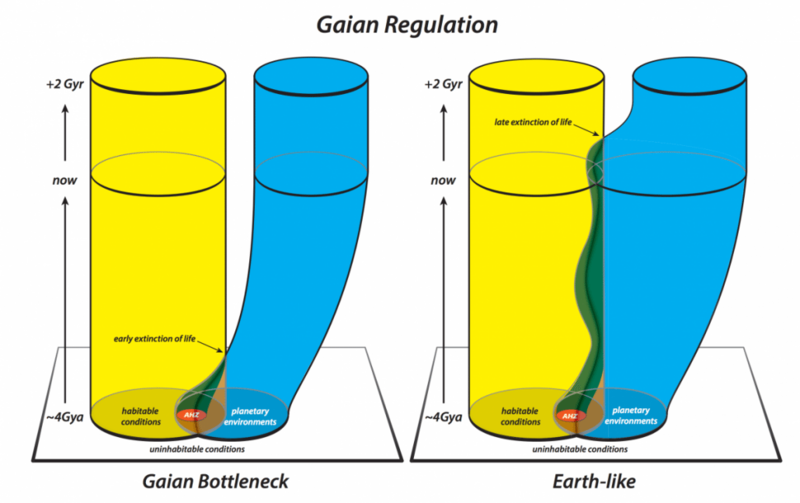 Paper: Chopra, Aditya and Lineweaver, Charles H. The Case for a Gaian Bottleneck: The Biology of Habitability Astrobiology. January 2016, 16(1): 7-22. doi:10.1089/ast.2015.1387. Perhaps is due to timing and the fact we are looking into the past when we look or listen for aliens. We very well could be *one of* the first civilizations to develop based on the time required for the evolution of the Universe. There could be others out there that are in a similar (or less so) level of development. If we send out radio waves into space, and the closest civilization is 300 light years away, then they won’t receive it for 300 years. Maybe 150 years ago, a civilization sent a signal out, but we still need to wait another 150 years for it to arrive. On the flip side of that, maybe there are a far more advanced civilization out there that communicate in a fashion we do not know about that can travel faster than the speed of light. (like Star Trek’s subspace) It could be that our space (or whatever medium) is filled with communications traffic and we don’t even realize it. If there were TV and radio broadcasts back in the 1500s, nobody would have likely noticed. Life arising early certainly suggests that formation is easy. But doesn’t the fact that ALL life is DNA-based suggest otherwise? Every living thing from an elephant to a human to a single-cell bacteria has a common ancestor. If life arises easily, shouldn’t we expect many types of life? Unless of course DNA is the ONLY molecule that life can be based upon, AND DNA easily forms. Is other life in the solar system DNA based? If we ever do find evidence of microbial life on Mars, Europa, Enceladus, or elsewhere in this solar system, that’s the biggest question I want answered. It would imply that life can travel between planets. How about life around some star halfway across the Galaxy? Is it DNA based? It may be doubtful that it can travel between star systems. To date, exactly 0 hyperbolic objects have been seen coming through our solar system (except for a little solar wind from Beta Pictoris). And every one that comes through has a 1 in billions chance of hitting Earth. So its likely we’ve never been struck by anything from outside our solar system. Along these lines (” It could be that our space (or whatever medium) is filled with communications traffic and we don’t even realize it”) my fave is neutrinos: their flux is huge, yet we can detect but a vanishingly small fraction of them, if some advanced aliens are using neutrino detectors as sensitive as our light ones are, and some equivalent of spread-spectrum techniques to encode messages, we’d be utterly blind to all their communications! may I offer you these six thoughts? 1. The further away from a mass you travel the slower time moves, would this not also effect the energy traveling thru said time-space? The slower time moves, the faster you you travel? 2. The Rosenberg-Einstein Bridge, he’s been right about so many other things, this theory would give ‘Aliens’ anytime access to our solar system, and the planets in there of. 3. Perhaps we need to re-define ‘life.’ Not all bodies have the same shape, and not to forget, all bodies need not the same elements to thrive. Nor do they need the same environments. Does not life live in the frozen arctic’s extreme? In and/or under the ice? Was not the first life started here said to appear around volcanic vents on the sea floor at extreme high temperatures? Then there is the fact that: ‘Need all life be of a carbon form’, and take in like elements as the carbons we do? 4. Let me say the unthinkable and that the equation of Reality is in error: -> ‘Life and time’ are one in the same, ‘space and matter’ are one and the same, and the third axis: the ‘thought and experience of A + B’ is the drive of A+B to =Knowing >- there is but one life and but one moment in this reality of Time/Life. Is there need to be but one galaxy, but one Universe? Could that one open to ours? a. We are to violent of a race and they are waiting for us to ‘mature’ and ‘settle-down’ our deceitful, destructive, and wasteful ways? b. They are there, but do not know how to communicate. If one was to walk up to you speaking Chinese, a language you do not have the slightest concept of, would you understand them? How long would it take for you to learn Chinese with out a teacher or guide? Just as so the same with it’s writhing, and need i mention; implement, slang, mispronunciation, accent, tonal, dialects, logic, deduction and abstract parallels, with different understanding and the misunderstandings associated with that abstract concept, adding symbols as different sounds? It’s one thing to read, but another thing speak and yet even more to converse. How long did it take ‘man’ to decipher ‘man’ text, can we speak it? Have we deciphered all of the writings that we found and it be a certain? 6. And last, the most obvious or need I be a ‘Conspiracy theorist’, and say ‘What is with all the’ rumors, declassified footage, files and documents, eye witness accounts, sightings and videos? NASA stating quietly: ‘Intelligent life’ will be found with in twenty-five years. Just see the view as so: Aliens dropped from heaven and started to intermingle with us ‘unexpectedly.’ There would be world chaos, upheaval and mass panic, our whole understanding would radically be altered. The government knows this, and is in so preparing the masses for full disclosure to be foreclosed soon, here about in the not to distant future. What will this disclosure will entail? Whatever it is, it is coming. after we destroy ourselves with our own devices and wastes. And they probably still be watching. Waiting?